Apple has called in a favor from Intel for the latest Mac Pro, drawing on a cutting-edge Xeon. Meanwhile, increasing numbers of 17-inch MacBook Pro owners have complained about swelling batteries, and an iPod has played a special role in saving a soldier's life. Intel on Thursday solved the mystery behind the 3GHz, quad-core Xeon found in Apple's new eight-core Mac Pro. The processor had triggered confusion for those keeping a close eye on Intel's workstation offerings, as it fell outside of Intel's often well-defined roadmap and was nowhere to be seen on the chipmaker's Xeon product site. Discussions with the company itself, however, quickly revealed that Apple had repeated the tactic behind its Apple TV device and requested a special chip to accommodate its special needs —in this case, the Xeon 5365. The Mac Pro maker successfully preempted Intel's official plans by persuading it to release a one-off processor at the high clock speed. "We are indeed shipping a 3.0GHz Xeon version," Bill Kircos from Intel said. "For now, the product is in limited production and Apple has chosen to adopt it. We will introduce another 3.0GHz Xeon SKU later on as well." Intel's line officially ends with the quad-core Xeon 5355, which had been released as part of the 5300 series in November but has remained locked at a 2.66GHz maximum speed until today. The Mac Pro is so far the only known professional workstation to have the 5365 model, making it potentially the fastest of its kind until larger quantities of the chip leave Intel's factories. A more pressing crisis this week was the steady rise in claims that the lithium polymer batteries in 17-inch MacBook Pros were failing. 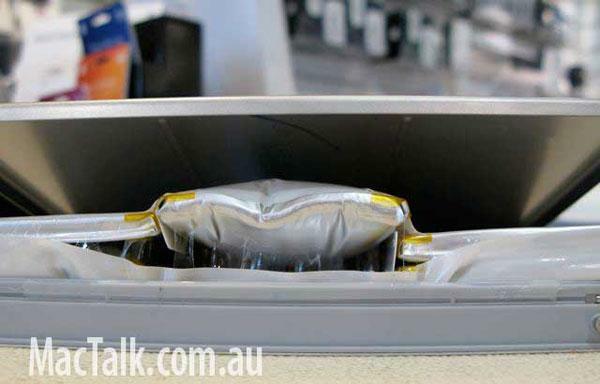 Owners and technicians in separate instances have posted photos showing the battery packs to have bulged outwards, deforming the aluminum shell and making them all but unusable. "It had bulged out from the insides," one repairman said of a battery that arrived at his desk. "At first, i didn't realise that it was a battery, until i turned it over and pressed the power-indicator button. The battery seemed to still work!" A swollen 17-inch MacBook Pro battery. Apple has yet to comment on the issue. However, the issue immediately draws parallels between itself and the battery recall for 15-inch MacBook Pros last year due to a similar inflation problem. AppleInsider readers who experience the problem are advised to contact Apple and stop using the battery immediately; while no more serious incidents have been reported, bloating is sometimes the precursor to a dangerous fire. In more optimistic news, one iPod was found to be far more useful to its owner than as a simple music jukebox. US infantryman Kevin Garrad can now claim that the Apple device saved his life while on patrol. 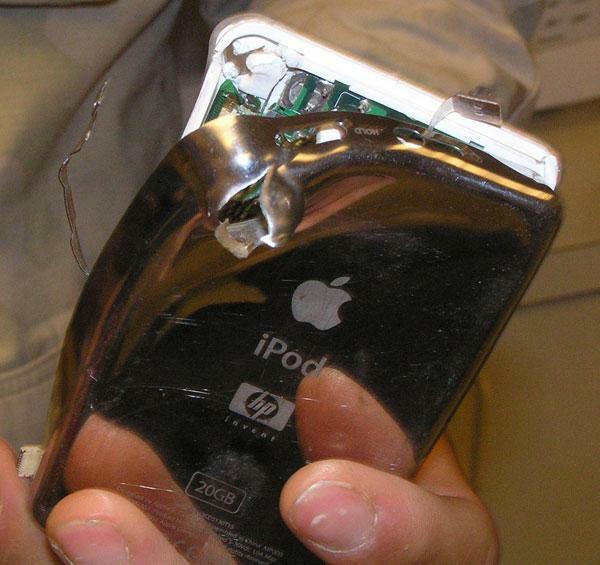 A series of photos posted to Flickr this week provided evidence that the soldier's fourth-generation iPod absorbed the impact of a 7.62mm round fired from an Iraqi rebel's AK-47, letting the bullet through but softening the blow just enough to stop the bullet from completely piercing the Kevlar armor underneath. iPod takes one for the team. Thankfully, Garrad was completely unhurt by the shot. The iPod was less fortunate and was rendered unusable; surprisingly, however, many of its parts remained intact despite the fatal blow.